The U.S. Department of Education unveiled the My Student Aid app to help make the 2019-'20 FAFSA application process easier. That's when first-time and returning college students can get their first look at the 2019-'20 FAFSA, the Free Application for Federal Student Aid. Anyone who wants the government's help paying for college has to finish the notoriously complicated form. 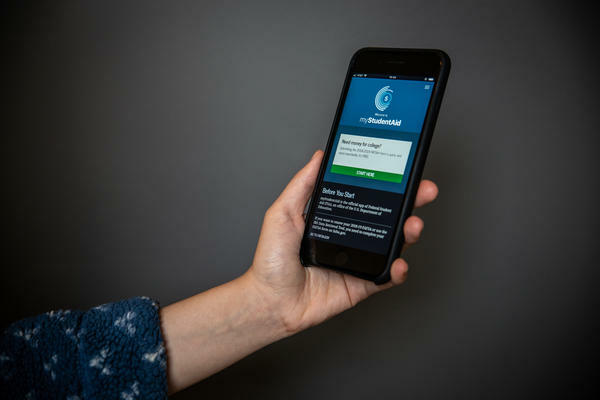 But this year, in an effort to make it easier, the U.S. Department of Education has given the FAFSA a new look: a smartphone application for iOS and Android devices. "Every year, we handle over 250 million transactions of some shape, form or fashion," says A. Wayne Johnson, the chief strategy and transformation officer at the department's office of Federal Student Aid. The problem, Johnson says, is that students who most need help paying for college often have the hardest time filling out the FAFSA. It asks questions about families' income and tax status that many low-income students struggle to answer because the only computer in their lives is at school — where their parents can't help them. That's why, when Johnson arrived at the department last year, he says, "the very first thing that I wrote on my board was FAFSA." As in: How can the department make this thing easier? Considering the government received 19 million FAFSA forms in 2016-'17, making it easier could help a lot of potential borrowers. "We want the experience of a student to be every bit as good as if they were a customer of American Express, a customer of a major credit union," Johnson says. He should know. His hiring was controversial with some Democrats because he comes from the private banking world. Johnson has worked for VISA and even run his own, private student loan company. Since coming to the department, Johnson says he's fast-tracked the development of the My Student Aid app. Ultimately, the department hopes the app will be a one-stop shop for students. A place they can research colleges, check their loan balance and even make a payment. But the real game-changer comes soon, Oct. 1, when borrowers will be able to fill out the FAFSA on their phones using the new app. "Many families, including low-income families, rely on smartphones solely for their internet access," says Kim Cook, executive director of the National College Access Network. Cook says, in the past, many students had no choice but to fill out the FAFSA in a school computer lab. They still can, especially if they're getting help from a counselor, but now they can also take it home — for the questions that only a parent can answer. They'll also be able to access the IRS' data-retrieval tool, which helps students by autopopulating the FAFSA with key tax information. Cook believes this new app also changes the game for school counselors and advocates, like her, who are trying to spread the word about the importance of applying for federal student aid. A mobile FAFSA allows them "to meet students where they are, at festivals, at football games. To meet parents where they are, maybe at brownbag lunches or financial aid nights." It turns out, Cook's group worked with the department to do early user-testing. "Students flew through this app," Cook says. "It was amazing to see how native they are to using apps. They said the app was easy. Parents as well." Cook says they did find a few hang-ups, and the department insists it's listening and already making changes. The fact is, this form still won't be easy for everyone. It never will be — unless Congress radically rewrites the FAFSA. For now, though, students can take some comfort knowing that it may not be easy, but it did just get easier. College students face a busy time come October 1. That's when they can begin filling what's called the FAFSA, the Free Application for Federal Student Aid. Anyone who wants government financial aid fills this form out. This year, the U.S. Department of Education is unveiling a new smartphone app, hoping to make a complicated process friendlier. Here's NPR's Cory Turner. CORY TURNER, BYLINE: The Ed Department is many things - an enforcer of laws, a purveyor of policy. But did you know it's also one of America's biggest banks? A. WAYNE JOHNSON: Every year we handle over 250 million transactions of some shape, form or fashion. JOHNSON: The very first thing that I wrote on my board was FAFSA. TURNER: As in, make it easier. Johnson has the kind of title you'd expect from a high-flying tech company, chief strategy and transformation officer. JOHNSON: We want the experience of a student to be every bit as good as if they were a customer of American express, a customer of a major credit union. TURNER: Johnson should know. His hiring was controversial with some Democrats because he comes from the private banking world. He's worked for Visa and even run his own private student loan company. Since coming to the Ed Department, Johnson says he has fast-tracked the development of My Student Aid smartphone app. ABRAHAM MARINEZ: Cool. So let's dive in. TURNER: Abraham Marinez also works at the Ed Department, and recently he and Johnson walked me through some of the new app's key features. MARINEZ: Let me search for some colleges, universities in the state of Maryland. And if I just want to do that and see what shows up, I just hit search. TURNER: Ultimately, the Department hopes this app will be a one-stop shop for students, a place they can research colleges, check their loan balance and even make a payment. But the real game changer is that on October 1 they'll be able to fill out the FAFSA on their phones. KIM COOK: Many families, including low-income families, rely on smartphones solely for their Internet access. COOK: To meet students where they are, at festivals, at football games. To meet parents where they are, maybe at brown bag lunches or financial aid nights. TURNER: If you're thinking, this sounds great, but what in the world does the Education Department know about building a good app? Well, it turns out Cook's group worked with the Department to do early user testing. COOK: Students flew through this app. It was amazing to see how native they are to using apps. They said the app was easy. Parents, as well. TURNER: Cook says they did find a few hang ups, and the Department says it's already making changes. The fact is this form still won't be easy for everybody. It never will be unless Congress radically rewrites the FAFSA. For now, though, students can take some comfort knowing it may not be easy, but it did just get easier. Cory Turner, NPR News, Washington. Transcript provided by NPR, Copyright NPR.